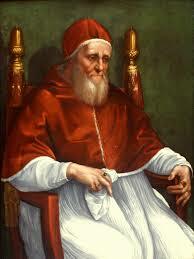 Pope Julius II, known as the warrior pope, involved himself in several wars in defense of the church and its land. Although his military actions damaged the holy reputation of the papacy, he successfully protected its interests. In addition, Julius was one of the leading patrons of the arts in the Renaissance. Julius was born Giuliano della Rovere in Albissola, a town in northwestern Italy. He owed his career to a wealthy uncle who financed his education. In 1471 this uncle became Pope Sixtus IV, and shortly after that Giuliano became a cardinal. This new position led him to France and other countries to serve as an official representative of the pope. In 1474 Giuliano went to war-torn Umbria, part of the Papal States, to end the fighting there. In Umbria he gained a taste for battle, which suited his energy and strength. He remained in Rome until his enemy ALEXANDER VI became pope. Feeling unsafe, Giuliano went to France and later to northwestern Italy, where he lived until Alexander’s death. In 1503 Giuliano returned to Rome and was elected pope. His strong character and his reputation as a defender of the church helped him win the position. As Julius II he struggled to recover some lands that Venice had taken in the Romagna, a part of the Papal States. In order to defeat the Venetians, Julius joined the League of Cambrai in 1509. This alliance combined the forces of the French king Louis XII, Spain’s FERDINAND OF ARAGON, and the emperor-elect of the Holy Roman Empire, MAXIMILIAN I. The group effectively pressured the Venetians into returning the land. However, Julius continued his battle to protect papal interests. Wanting to ensure Italy’s safety from the mounting French threat, he turned against his former ally and joined the anti- French Holy League. The League, which consisted of leaders from Spain, England, and other countries, fought to drive French troops from Italy. Julius was finally victorious in 1512. In addition to his military actions, Julius II was one of the most important artistic patrons of the Renaissance. He commissioned one of the most famous works of the Renaissance, the Sistine Chapel ceiling, painted by MICHELANGELO BUONARROTI. Julius also employed RAPHAEL to paint several frescoes*, including the famous School of Athens for his Vatican apartment. Raphael’s portrait of Julius influenced the way artists portrayed popes for centuries. An alliance of Pope Julius II (r. 1503- 1513), Louis XII (1462-1515) of France, Emperor Maximilian I, and Ferdinand II of Spain, as well as several Italian states. In name it was a treaty that aimed at punishing the Ottomans. In fact, it was an aggressive alliance that aimed to dismember Venice and divide the carcass of that watery empire. A French army defeated the Venetians at Agnadello in 1509. The alliance quickly collapsed, however, as a result of too many competing ambitions and interests among the allies. Spain withdrew into neutrality and the Papal States switched sides upon receiving some concessions from Venice, and in order to forestall further French advances in Italy. This entry was posted in Biography, Military and Naval by MSW. Bookmark the permalink.